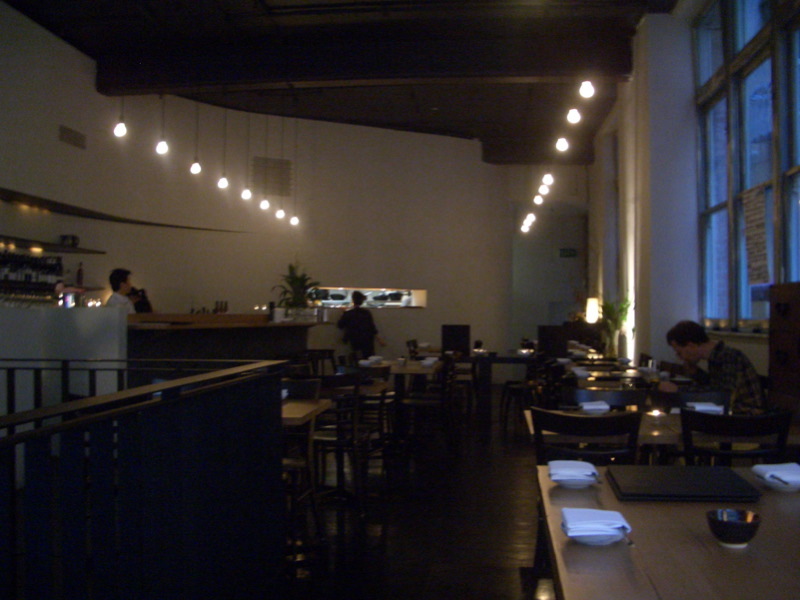 In 2005-2006, the adorably yet ludicrously tiny (seriously: there was only seating for about 12-15 people, tops) Hako became my new favourite Japanese restaurant in Melbourne. 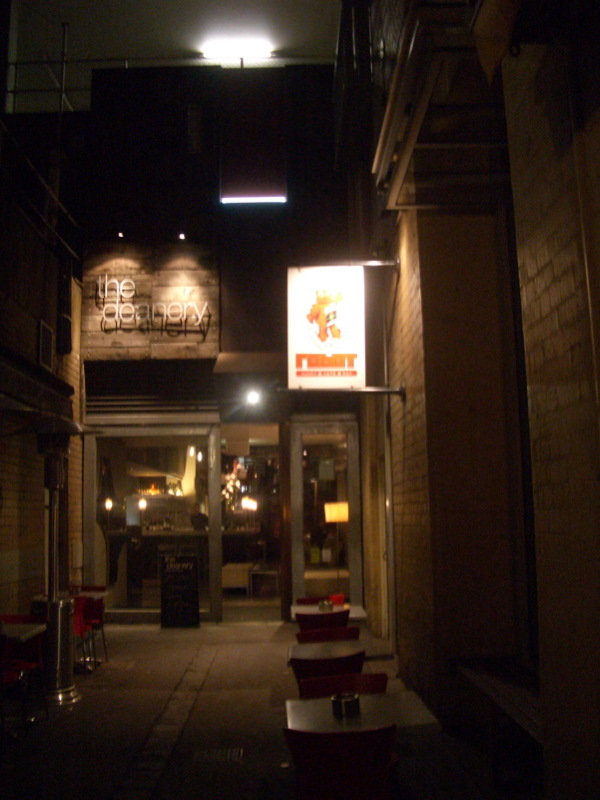 Located in Degraves St near Flinders St station, it proved to be a handy pre-Hamer Hall/Arts Centre restaurant (for all those times I was sick of the blandness of Southgate and Chocolate Buddha), and when I was studying Portuguese at the CAE I'd often pop in for a cup of sake and a snack while hurriedly finishing off my homework for that night's class. We sat at the table in the front window (good lighting for my digicam, heh heh) and started off with a bottle of warm sake and a serve of edamame ($5.80). 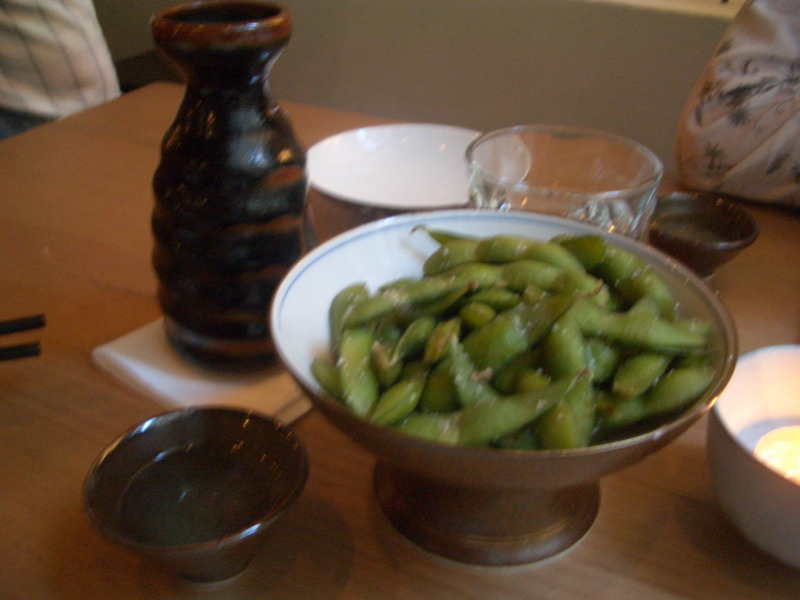 The edamame-eating process of popping the juicy soybeans out of the salt-sprinkled pods with your teeth is fun. We decided to share a bunch of lightish dishes. 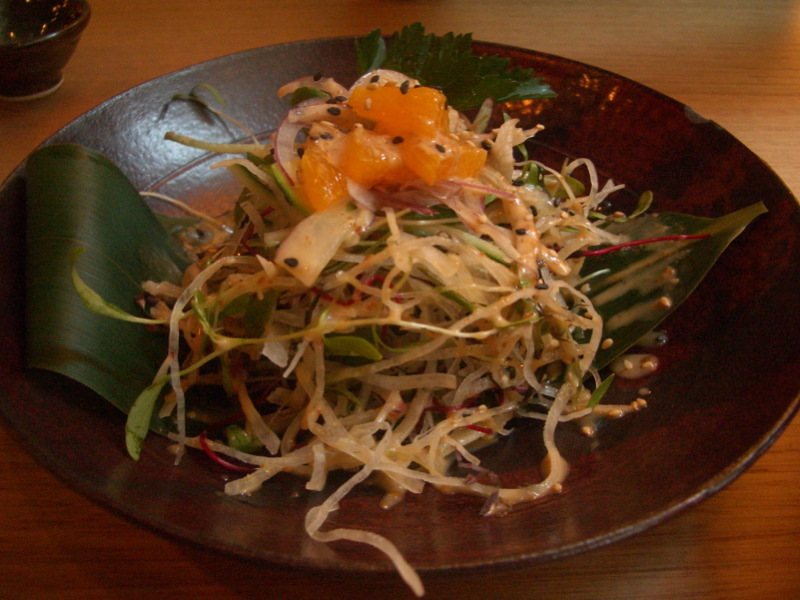 The first of these was the daikon salad with sesame dressing ($10). It was fresh and crisp, and I really liked the dressing and the mandarin segments. 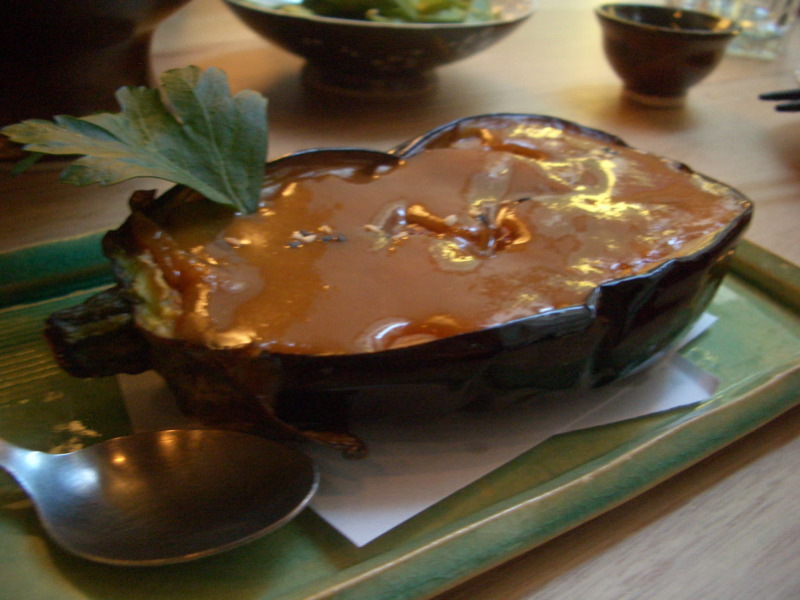 Next was the nasudengaku - fried eggplant with sweet simmered miso sauce ($9.80). Although I'd seen it on a ton of menus, I hadn't had this dish before and was expecting the eggplant to have been cooked in slices. So I was a little surprised when a perfect half eggplant came out intact with a layer of thick miso sauce spread along the flat upper surface. 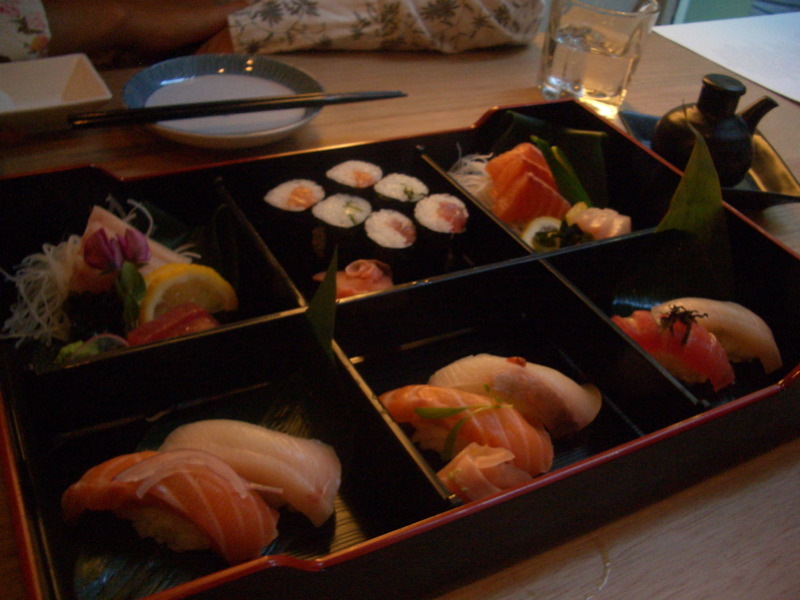 With just spoons and chopsticks it was a little tricky to divvy up between three, but it was well worth the effort. On an academic sidenote, the excellent Japanese cultural website The Black Moon informs me that "Dengaku is one of Japan's oldest types of miso cuisine. It consists of grilling various types of skewered foods, then coating the food with a thin layer of sweetened miso and grilling again." The name dengaku comes from the music played centuries ago at Japanese rice harvest festivals - the dengaku dancers used to perform with long sticks that represent the skewers. F likes sushi nori rolls whereas I prefer nigiri zushi and sashimi, so we decided to get the moriawase, a mixed platter of all three. It cost a hefty $35.80, but was soooo good. These weren't your typical depressed limp wafers of has-been salmon and tuna: the slices of fish were firm and plump and fresh. I'm kicking myself that I didn't ask about which fish were included, but there were at least five varieties, possibly two kinds of tuna. I have forgotten where I have had nasudengaku before - I think it was in Australia - but those who know me realise that if I see something I don't recognise on a menu it's probable I will order it. Though I found it a bit daunting to tackle, and frankly it's a slightly silly way to eat eggplant, I did enjoy it. Mutemonkey, have you been to the Deanery at the end of the lane? Mutemonkey, it's been a little while since I was able to visit people's blogs... yours is looking great. So many wonderful posts to read. I was very jealous to have missed the bloggers banquet. Hi Rumpole, thanks for writing. In answer to your question, I have not been to the Deanery - yet. Is it any good? Food, wine selection, vibe? Dang, yet another place I need to try. Sound fantastic though. Oooh, I'll have to try this place. The nasudengaku looks great! 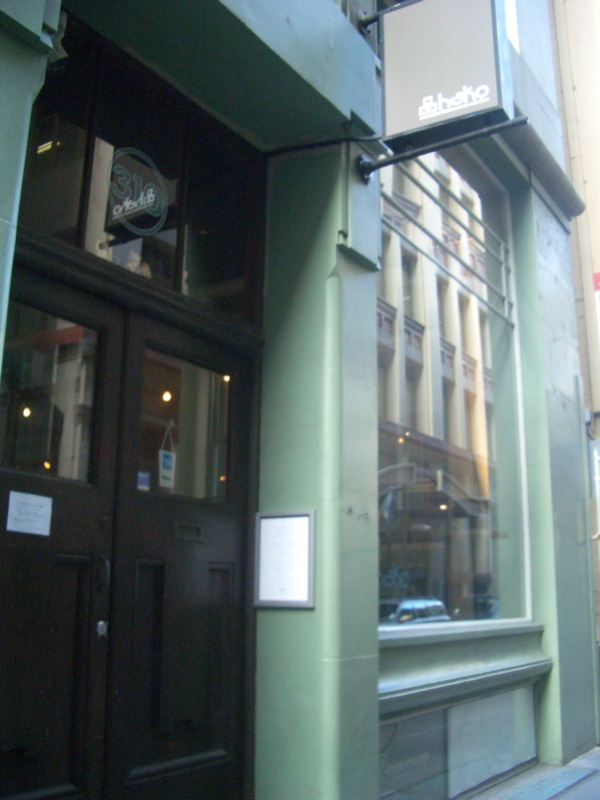 I remember when that venue was home to Zuccini an incredible ground breaking macrobiotic molecular experience that went over the heads of Melbourne diners, long before George Colambaris and Ray Capaldi started doing it. I'm glad Hako has taken up this space, it has a good vibe. Love Robot and the Deanery too. 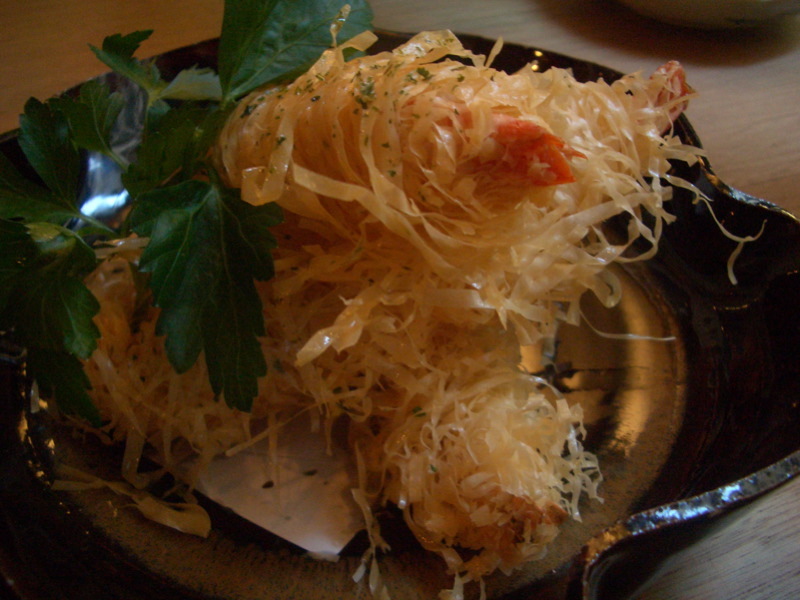 For dengaku, my favourite comes from Misuzu's in Albert Park.